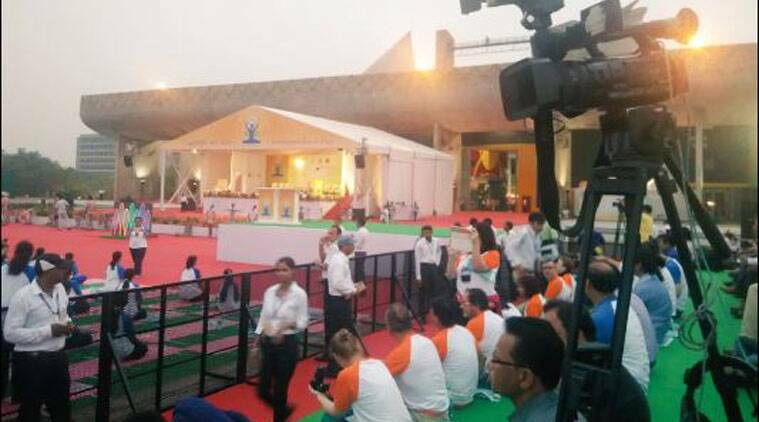 Prime Minister Narendra Modi today joined over 30,000 people in Chandigarh for the second International Yoga Day celebrations as he pitched for treating diseases like diabetes through the ancient spiritual discipline. Modi, dressed in a white-coloured t-shirt and trouser along with a scarf, led over 30,000 participants, including defence forces personnel and school children, for the second International Day of Yoga celebrations at the Capitol Complex amid tight security. The Prime Minister, who arrived in Chandigarh last night, participated in a mass demonstration of ‘Common Yoga Protocol’. A yoga enthusiast himself, he performed yoga ‘asanas’ along with the people at the event. 9: 30 am: Goa CM Laxmikant Parsekar and Uttarakhand CM Harish Rawat celebrate Yoga day. 9:00 am: International Yoga day was celebrated on the banks of Thames in London. 8:00 am: The event has concluded. 7:58 am: The demonstration has concluded. The Prime Minister is interacting with the crowd. 7:50 am: The demonstration has now entered the third and final phase. 7:35 am: Here are some pictures of the Prime Minister during the session. 7:20 am: Meanwhile, in Delhi, L-G Najeeb Jung and Union Minister Venkaiah Naidu are leading the celebrations. 7:12 am: The Prime Minister has concluded his address. Participants begin to practice Yoga now. 6:50 am: PM Modi is addressing the audience in Chandigarh. 6. 25 am: 14 people taken into custody by Chandigarh Police for protesting near the Yoga Day venue. They tried to protest after they were not provided entry cards by the administration. 6. 05 am: Around 150 differently-abled students also participating in the Yoga Day event in Chandigarh. 5.48 am: Crowd and media persons settle down at the venue. Prime Minister Narendra Modi to arrive shortly. 5. 45 am: Watch enthusiastic crowd of mostly students reaching the Capitol Complex to participate in the Yoga Day celebrations. 5. 20 am: Participants starts arriving at the venue for International Yoga Day in Chandigarh.